It is a curious colour, this I will accept, for it sits between yellow and orange in the spectrum, and yet it possesses none of the characteristics of either of these shades. In fact, it’s almost in exact opposition to its loud, vivid, strident neighbours, both renown for being energetic attention grabbers. Peach, by contrast, is a Crayola crayon colour (you remember, the odd one that always got left over). A neutral with personality. A softener with interest. In the Art Deco period, a tint of peach was often used to colour mirrors in high class homes. And it was brought to my attention by one of my lovely Twitter pals (@MaccoolKyeyune thank you! ), that the BBC TV mini series about the fictitious fashion house, House of Elliott, also set in the 1920s, had entirely peach painted walls… it got me wondering whether this colour’s ability to flatter one’s skin tones meant that it was often used in fashionable salons of the day. 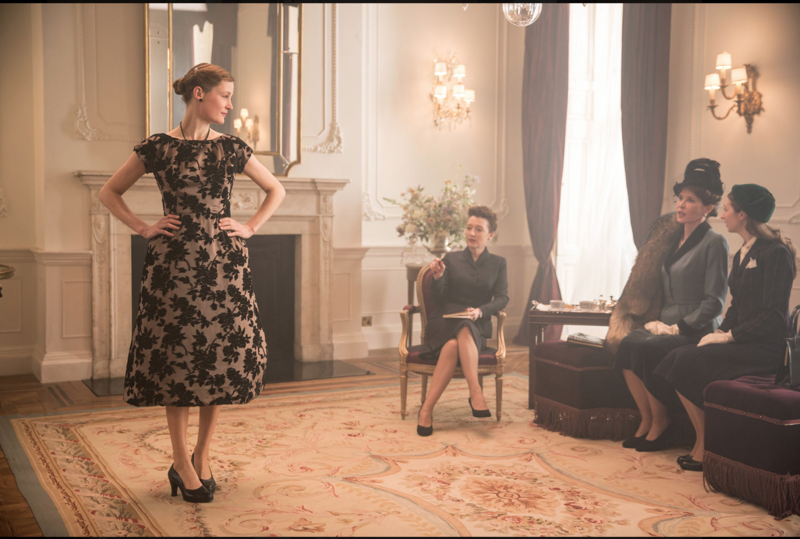 And then I looked up the imagery for Phantom Thread, the latest film by director Paul Thomas Andersen set in the 1950s world of haute couture dressmaking, and lo, there was the showroom/atelier of Reynolds Woodcock (the fashion designer brought to life by Daniel Day-Lewis), gloriously bathed in, what only a pedant would argue is not, a wash of lovely creamy peachiness, see below. And therein lies it’s possibilities for appeal today. 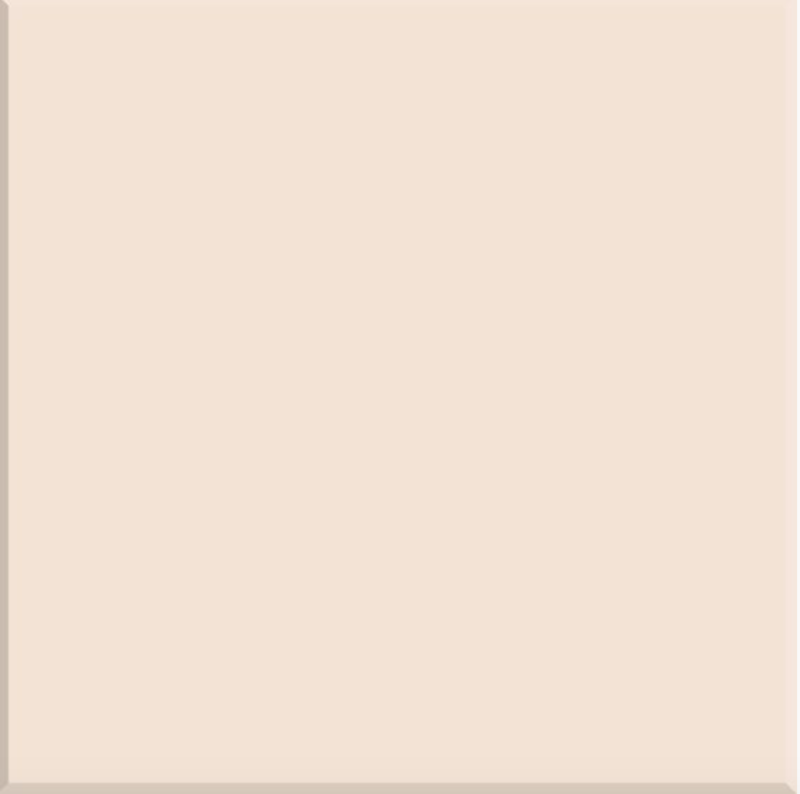 This is a colour that bathes you in a gentle glow. It is inoffensive yet incredibly effective. However, it’s innate lack of statement-making ability should not be something to scare you off. True, tis a mild-mannered hue. It’s unlikely anyone ever walked into a room and gasped, “Wow! That’s so stunningly peachy!” However I’d wager actual cash that they’d saunter in and feel instantly soothed. 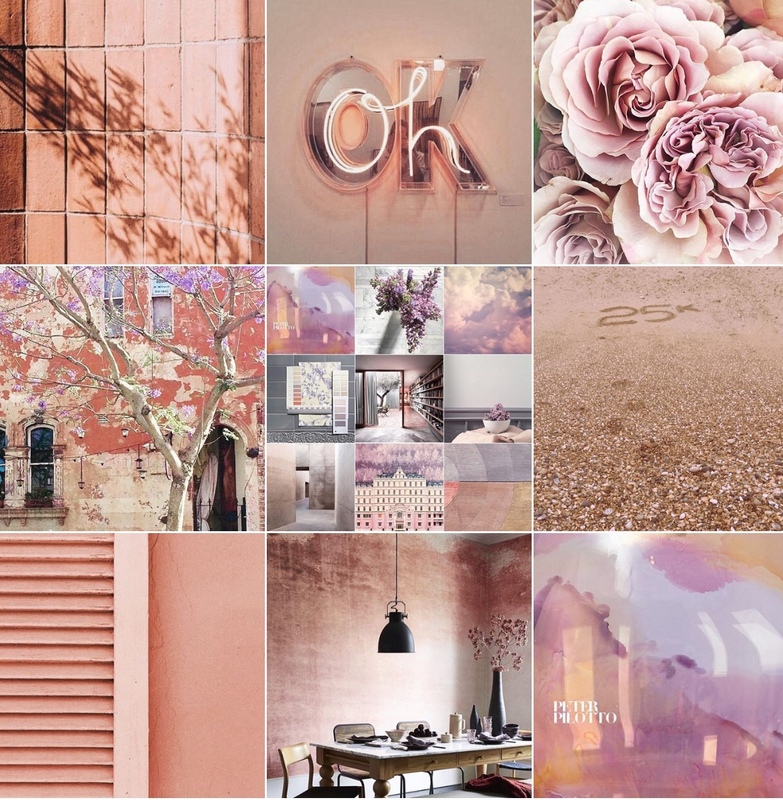 And to be clear, I’m not advocating an entire room bedecked in peach tones, two adjacent walls max; or better yet, a combination of a key wall and a carpet. And to keep that ‘feature’ wall contemporary, I’d suggest using tiles (I once did a whole bathroom wall in these Johnson Prismatics Peach Sorbet gloss tiles) or wallpaper (I rather love this Anna French ‘Bird in the Bush’ paper), not necessarily just flat colour. Paint could be used for associated woodwork, or built-in shelving perhaps. Note: it is often recommended to pair peach with blue, as this is its opposite on a colour wheel. I have to say I heartily disagree with this. A peachy top with blue denim, ok-ish, but it’d look better with white jeans, and so it is at home. 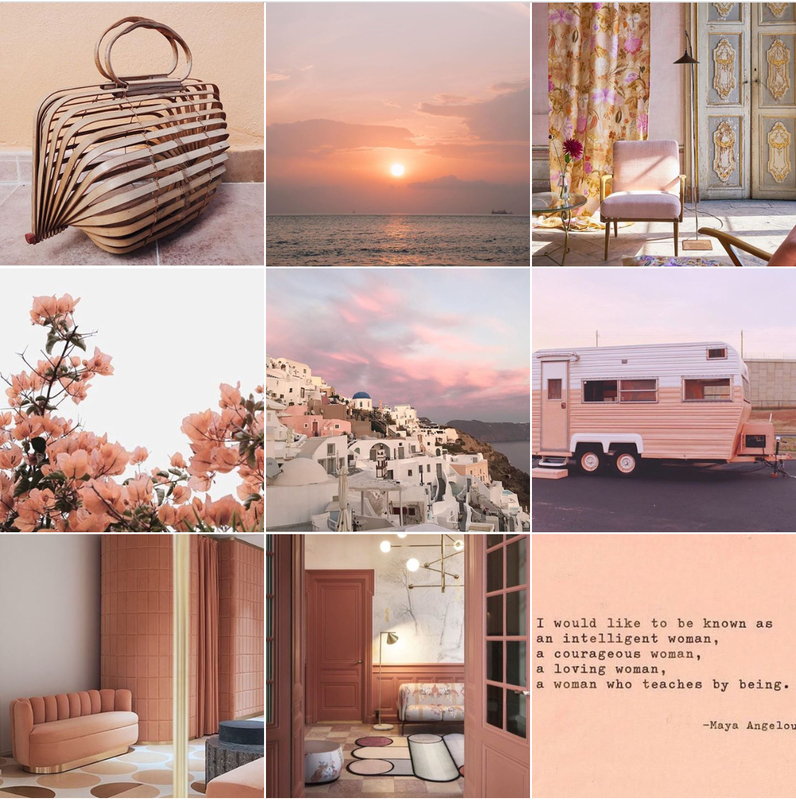 Keep it all soft, keep it muted, keep it creamy and dreamy, and let peach do its thing unopposed. Powder pink to Blush pink. The difference is subtle, yet both would work here. Rose, old or yellow gold accents. Not copper. Terracotta. To bring out the earthy qualities of peach. Wood, from ash to walnut. Other naturals like rattan, sisal, cork and bamboo. Delicious. Creamy white. Bright white will be too harsh. Touches of black to add edge and definition. 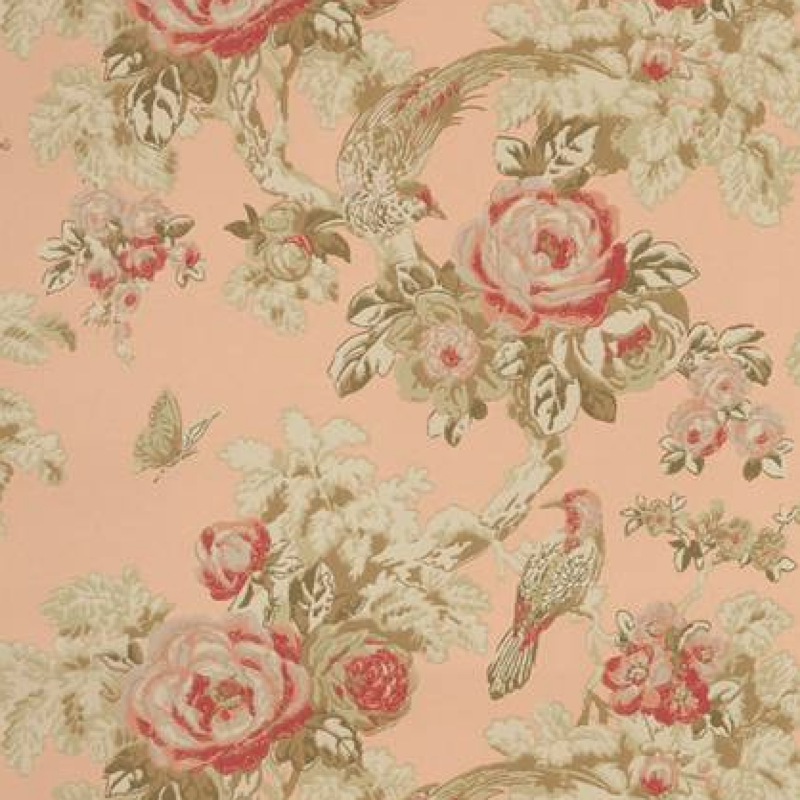 ‘Bird in the Bush’ wallpaper from the Anna French ‘Wild Flora’ collection. ‘Peach Sorbet’ gloss tile from the Prismatics range at Johnson tiles (PRG36). Suitable for interior walls only.